Dark Reign strikes Marvel's first family—in an explosive way! Prepared to be blown away as: HAMMER agents attack the Baxter Building. Reed changes everything. 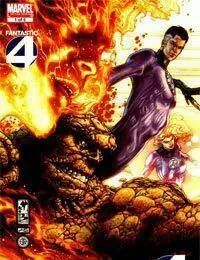 The Human Torch suffers a horrible loss and Franklin and Val go shopping. Theres Time travel, Alternate realities, Celestials, Eternals, Deviants and Doombots... and more important than all of that, we find out the answer to the question: What is the Bridge?